Six VCUQ MFA Theses added to the VCU Digital Archive. 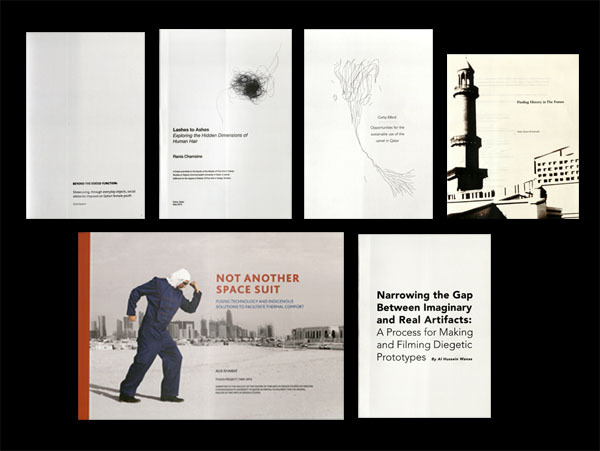 Six VCUQatar MFA students officially joined a long list of prestigious Virginia Commonwealth University masters’ alumni with the recent publication of their theses on the VCU Digital Archives site. The publication is extra meaningful to us here at the VCUQ MFA department, because it marks the first group to officially graduate since we started the program in 2009. Since the archive will be maintained in perpetuity, the publication of this first group of theses will be a permanent reminder of the hard work and perseverance of our students. It’s a quite impressive if you think about it: in 200 years, researchers and students will be able to access the research exploration those students took during their tenure here at VCUQatar. Alia Khairat, who wrote “NOT ANOTHER SPACE SUIT: Fusing Technology and Indigenous Solutions To Facilitate Thermal Comfort” as an analysis of the clothing being used by laborers in Qatar. She also proposed new designs that provided for the laborers’ sense of worth as well as their protection from the harsh environment. Corby Elford, who wrote “Opportunities for the sustainable use of the camel in Qatar” as an analysis of the past and present use of the camel in Qatar, paying particular attention to the utility of the animal’s hair. She also proposed a design for a agri-tourism system around the camel, sustaining the species and tradition of its utility into the future. Rania Chamsine who wrote “Lashes to Ashes, Exploring the Hidden Dimensions of Human Hair” as a critical look at hair as a cultural object – one that in the Middle East carries social and religious connotations. Her exploration led her to develop a series of products that recontextualize the references and symbolism of human hair. Aisha Al-Sowaidi, who wrote “Finding History In The Future” as an exploration of the experiences of the past in the fast-changing social environment of Qatar. She then developed designs for contemporary objects that incorporate the memory and nostalgia of disappearing behaviors and traditions. Al-Hussain Wanas, who wrote “Narrowing the Gap Between Imaginary and Real Artifacts: A Process for Making and Filming Diegetic Prototypes” as an analysis of the role of designed objects play within the media of fictional filmmaking. He explains how these artifacts work to structure micro-narratives within the larger narrative structure of a film. Esra Kazem, who wrote “BEYOND THE STATED FUNCTION: Showcasing, through everyday objects, social obstacles imposed on Qatari female youth” as a critical exploration of the obstacles that female youth often face within Qatari society. Her thesis also showcases objects she designed to provoke curiosity and stimulate conversations related to her topic. All of these theses represent just a portion of the work these students completed during their time at VCUQatar MFA. As a department we are extremely proud of the work they’ve accomplished. It’s a great group to showcase as our first group of graduates. © 2019 VCUQMFA.com. Hosted by vcuqmfa.com Sites.